The best choice for an entry level remote control. Simple, practical and equipped with spring centered sticks that centers when released, putting your aircraft into hover automatically. It needs just 4 AA batteries and works perfectly with DJI flight control systems requiring only a single D-Bus cable, and provides two switches and a gimbal pitch control slider. 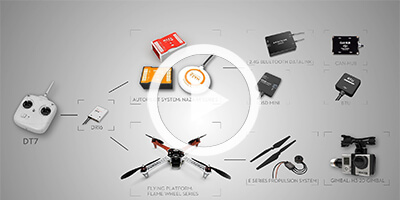 Combined with a Naza-M flight control system, Flame Wheel series flight platform and an H3-2D gimbal, it creates the best total solution for hobbyists. 5 proportional channels (including Slide Lever) and 2 3-Positon switch channels. Non-operation alert occurs if sticks in AETR channels are centeredwithout movements in 15 minutes. Firmware is upgradable using the RC System Assistant Software. Up to 16-channel remote controller support. 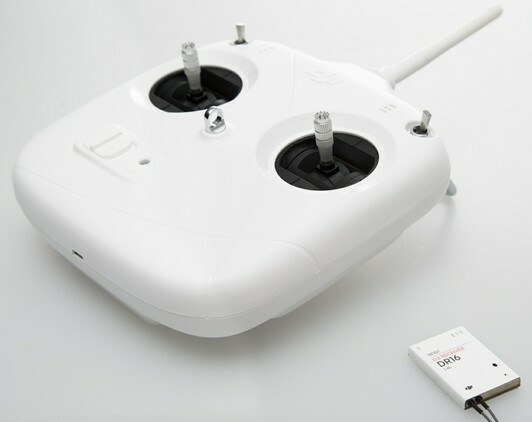 DT7 & DR16 RC System is compatible with following DJI flight control systems: NAZA-M Lite, NAZA-M, NAZA-M V2, WooKong-Mand A2. For safety reasons, do not use the power battery for power supply during firmware upgrade. Remember to reconfigure all parameters in the Assistant Software after firmware upgrade.